Evans, the first female to be named an executive vice president at CNN, obviously knows a thing or two about acquiring power. In this follow-up to her Play Like a Man, Win Like a Woman, she advises women to trump the old boys' network by playing a""girls' game."" Espousing a one-for-all, all-for one approach, Evans insists women must work together to""achieve a critical mass at the highest levels,"" concluding,""Every woman must always play on the women's team."" Leading readers step-by-step through the process of building formal and informal teams, Evans explores seven pivotal topics, including mentoring,""rainmaking,"" information-sharing and""webbing"" (networking with comprehensive, complex interconnections), while teaching women how to deal with challenges (including which people to cultivate and which to avoid) and dismantling popular myths and allaying common fears. 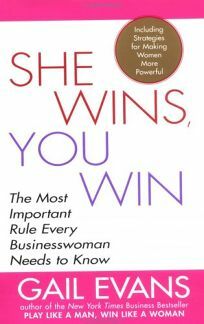 This is an aggressive but motivating handbook for women who are serious about career success.